The Amazing Prizes Winning Period! 21:00 PM - 20:30PM of the next day. During the winning period, the family leaders of the occupants can claim a pack of amazing prizes from the local reporter. The rewards change with the maps. The prizes will be canceled if the leader fails to claim before the next period. CronusPrize Contains 40.000.000 EPs, MoneyPoint and SupDivineExp. IcylandPrize Contains 30.000.000 EPs, MoneyPointand SupDivineExp. IslandPrize Contains 20.000.000 EPs, MoneyPoint and SupDivineExp. MarshPrize Contains 20.000.000 EPs, MoneyPoint and SupDivineExp. DesertPrize Contains 15.000.000 EPs, MoneyPoint and SupDivineExp. CronusPrize1 Contains 15.000.000 EPs and MoneyPoint. IcylandPrize1 Contains 15.000.000 EPs and MoneyPoint. IslandPrize1 Contains 15.000.000 EPs and MoneyPoint. MarshPrize1 Contains 15.000.000 EPs and MoneyPoint. DesertPrize1 Contains 15.000.000 EPs and MoneyPoint. CronusPrize2 Contains 10.000.000 EPs and MoneyPoint. IcylandPrize2 Contains 10.000.000 EPs and MoneyPoint. IslandPrize2 Contains 10.000.000 EPs and MoneyPoint. MarshPrize2 Contains 10.000.000 EPs and MoneyPoint. DesertPrize2 Contains 10.000.000 EPs and MoneyPoint. CronusPrize3 Contains 7.000.000 EPs and MoneyPoint. IcylandPrize3 Contains 7.000.000 EPs and MoneyPoint. IslandPrize3 Contains 7.000.000 EPs and MoneyPoint. MarshPrize3 Contains 7.000.000 EPs and MoneyPoint. DesertPrize3 Contains 7.000.000 EPs and MoneyPoint. FamilyPrize1 Contains random weapon (S II) +100 1024 fsoul +50 x4 elements. FamilyPrize2 Contains random weapon (S II) +150 1024 fsoul +150 x4 elements. FamilyPrize3 Contains random Gear Element (1 - 3). FamilyPrize4 Contains random MoneyPoint (50-200). FamilyPrize5 Contains DoomStorm skill book inside. 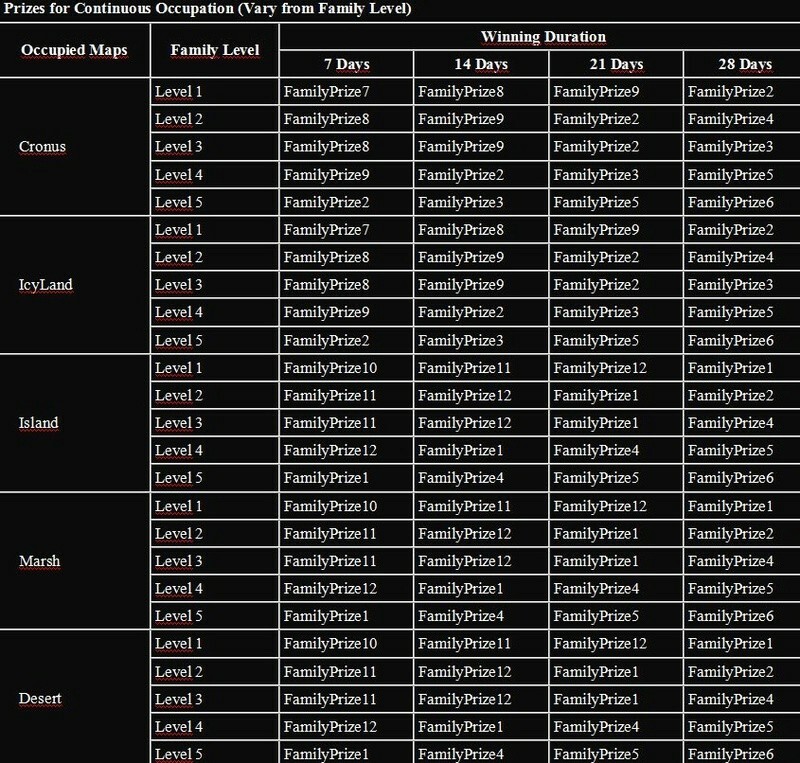 FamilyPrize7 Contains random DivineExp (100-300). FamilyPrize8 Contains random DivineExp (300-500). FamilyPrize9 Contains random DivineExp (500-800).